Detection of the TGE events and measurements of its amplitude were made with particle detectors comprised of plastic scintillators (see description of the detector construction in Chilingarian et al., 2010) and NaI crystals. Measured huge enhancements of the detector count rates is due to electrons and gamma rays, because both neutral and charged particles can generate signals in plastic scintillators, although with different efficiencies, see Table 1. Therefore, to estimate energy spectra of electrons and gamma rays we need to disentangle the mixture of electrons and gamma rays. 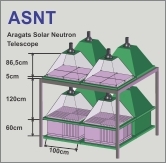 Special experimental facilities were designed and installed at Aragats for separating electron and gamma ray fluxes. Two 20 cm thick plastic scintillators located inside the Cube detector are completely surrounded by 1 cm thick molded plastic scintillators. Thick scintillators detect charged flux with very high efficiency (99%) and also neutral flux with efficiency 20-30%. Thin scintillators also detect charged flux with very high efficiency (98-99%), though the efficiency of detecting neutral flux is highly suppressed and equals to 1-2%. Using advanced coincidences technique it is possible to purify the neutral flux detected by inside scintillators, rejecting the charged flux by signals from surrounding thin scintillators. The calibration of Cube detector proves that veto system (preventing counting signal in the thick scintillator if there is a signal in at least one of surrounding six thin scintillators) can reject 98% of the charged flux (see details in Chilingarian et al., 2012). 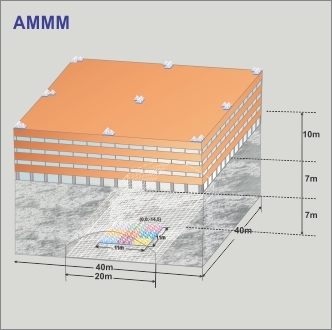 ASEC particle detectors are placed at high altitude, some of them under snow, and it is very difficult to keep stable detector operation (high voltage, electronics thresh- olds and other). 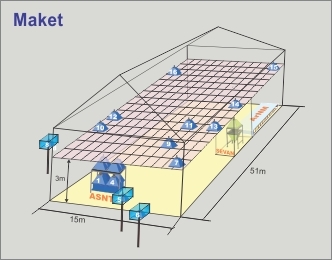 However, high altitude station staff maintained detector operation 24 h daily for 12 months yearly and on-line visualization programs ADAS (Chilingaryan et al., 2008) and ADEI (Chilingaryan et al., 2010) provide possibilities of the remote monitoring and control of the key parameters of detectors. All meteorological parameters, including atmospheric pressure are monitored; the barometric coefficients for all detectors are calculated and used for the count rate correction (Chilingarian and Karapetyan, 2011). In the Figure 1 we post the characteristics of the one of recent TGE events and explain how we enumerate it. The mean minutely count rate (m), variance (σ) and relative error (RE) shown in the histogram agenda are calculated by the 3 hour of fair weather data before TGE. The significance of peak at 3:04 is enumerated in the so-called “number of sigmas”, dividing the peak amplitude (48%) by relative error (0.66%). In the Table 1 we present the statistical characteristics of some of ASEC detectors; demonstrating as well their measurement of the 11 May TGE. The count rate and variance depends on the size of the detector and amount of matter above it. The highest enhancement demonstrated stacked 1 cm and 3 cm thick plastic scintillators, STAND and STAND 3 cm. 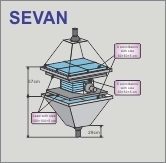 STAND consists of 3 stacked 1 cm thick scintillators, STAND 3, of – four 3 cm thick stacked scintillators of 1 m2 area each. The 1000 abbreviation means that signal comes only from upper scintillator and particle was stopped in it; 1100 – signal measured from 2 upper scintillators, etc. 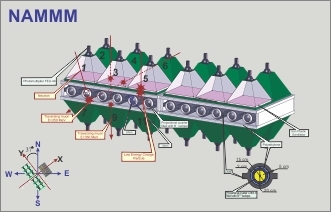 The MAKET scintillators have thickness 5 cm and they are located under metallic housing, therefor the threshold is higher and enhancement – lower. The smallest relative error 0.14% (and therefor largest significance 110 σ) has AMMM detector comprises from 27 m2 area 5 cm thick scintillators; largest relative error – 2.06%, the NaI crystal of volume 13.5 x 13.5 x 21 cm. In Table 1 we present the energy thresholds of electron detection at 50 and 95 percent efficiency of particle detection and efficiencies of gamma ray detection; note very high efficiency of NaI crystals due to ~5 radiation length thickness. The efficiency of particle detection by different combinations of stacked detectors allows recovering of the energy spectra.